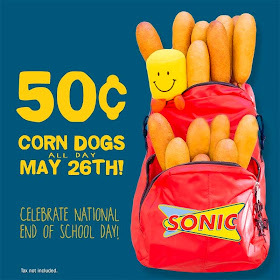 Be sure to head over to Sonic Drive-In on May 26, 2015 to celebrate National End of School Day! Corn dogs will only be $0.50 all day long! Yum! That's a really good deal for corn dogs.